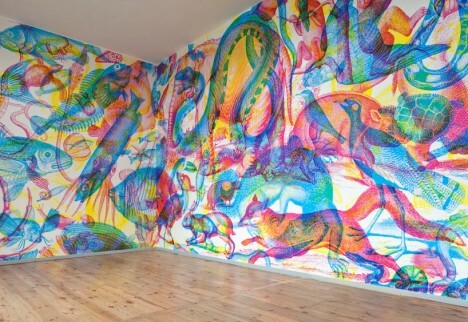 This wildlife-themed wall mural seems to invite the viewer to untangle the mess of animals, to make sense of the many shapes and colors all thrown together. It looks haphazard, and for the typical art viewer it may not seem to make visual or practical sense. But once a light switch is flipped, the method to this madness is quickly revealed. The multi-colored layers of animal shapes are not meant to simply confuse the eye; rather, they are a sort of color puzzle that only becomes apparent once the ambient light shifts from one color to the next. 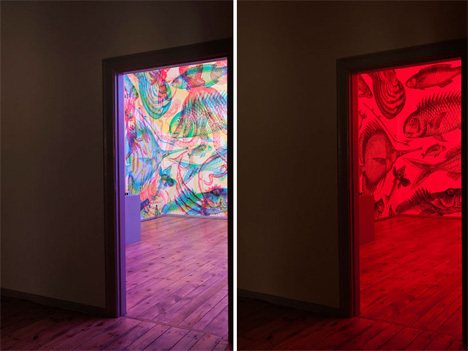 It is an RGB (red-green-blue) mural that is chaotic in white light but perfectly ordered in red, green or blue light. 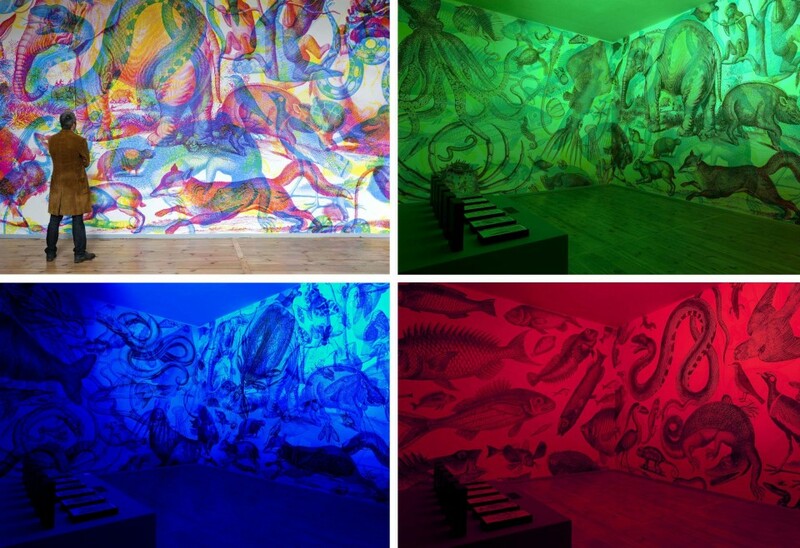 Different parts of the mural are revealed as the room’s light changes color. 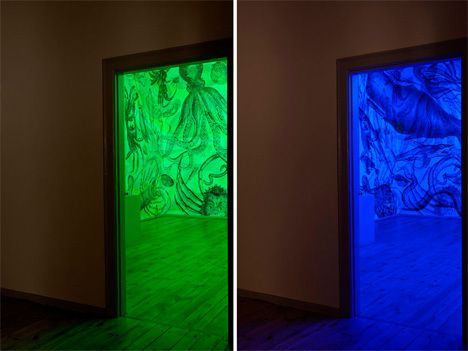 A simple colored filter over the room’s lighting source or a piece of colored transparent plastic held over different areas of the mural reveal one layer of the piece at a time. The once-jumbled mass of lines and colors resolve into three separate pieces of art all occupying the same physical space on the wall. 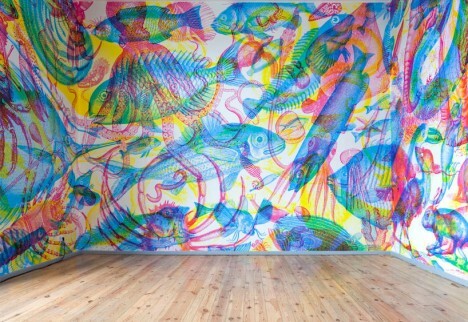 The mural and many other smaller, similar pieces are the work of Milan-based collective Carnovsky. The pair of artists experiments with the visual effects of chromatic manipulation as well as the emotional associations of the different colors. 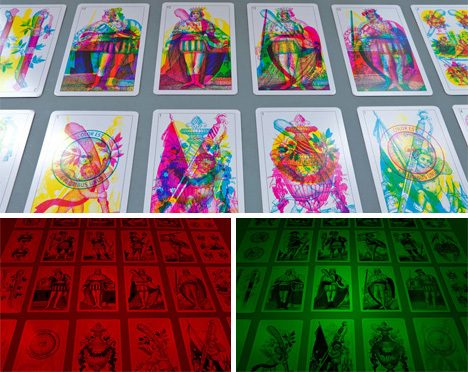 The smaller works, such as the Tarot cards above, are fun to look at but lack the awe-inspiring effect of an entire room of shape-shifting RGB art.